Welcome to Saskatchewan is A Thing, my compilation of all of the random references to Saskatchewan, which I believe is over-represented when it comes to random references, chasing some of the greats like Timbuktu and Tripoli. If you know of a Saskatchereference that I haven't featured yet, please leave a comment! Once again, it's been a while since I posted a Saskatchereference. It may have something to do with the fact that this particular one is a bit tenuous. Last year I reviewed Hotel by Arthur Hailey. While it was reasonably entertaining, it did end up on the chopping block when I did my latest "weeding" of my permanent book collection. That is, until I remembered that Saskatchewan shows up in this novel. "Has there been an arrest?" The detective shook his head. "Wasn't discovered till hours after it happened. There is a lead, though. A neighbor saw a car. Couldn't remember anything, except it had license plates that were green and white. Five states use plates with those colors—Michigan, Idaho, Nebraska, Vermont, Washington—and Saskatchewan in Canada." I call this a "tenuous" Saskatchereference because it's not as gratuitous as a typical one. 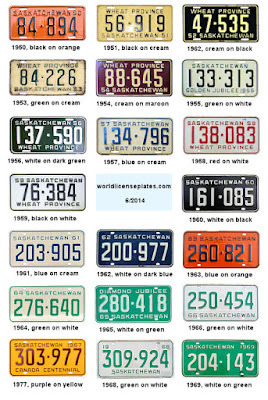 "Saskatchewan" isn't invoked as a funny or exotic place, but simply because the fact is that the license plates in Saskatchewan were green and white. They're still green and white at present, actually. 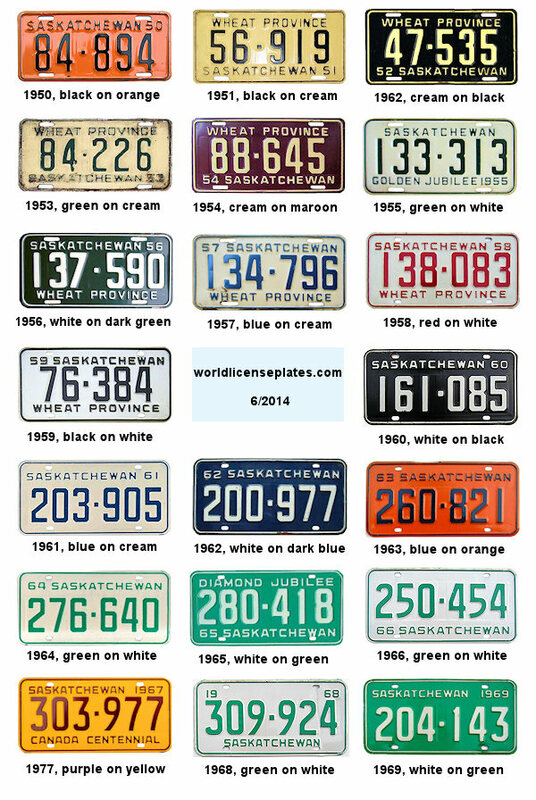 In fact, the most interesting thing about this to me is that Hotel was published in 1965, during an era in which Saskatchewan license plates were exchanged each year for new plates with a different appearance. Two years prior, in 1963, the plates were blue on orange. Two years later, in 1967, they were purple on yellow. Here's a graphic from WorldLicensePlates.com which has an error or two but conveys the gist of what I'm saying. I appreciate Arthur Hailey's commitment to exhaustive detail and commend him for getting this particular one right.